Phiona Mutesi (Madina Nalwanga) was three when her father died. When she was nine, Phiona's family, living in the poverty-stricken slums of rural Uganda, had to pull her out of school because of their financial situation. Phiona sells maize in the street to try to scrape together some money for her family, which includes her two brothers, a sister, and her mother Harriet (Lupita Nyong'o). One day, Phiona and her oldest brother Brian (Martin Kabanza) meet a soccer player turned missionary named Robert Katende (David Oyelowo). Instead of sports, he teaches them the art of chess. Phiona is captivated as it is a game that can be played by anyone in the world, and requires everyday skills such as concentration, strategic thinking and risk taking. Robert soon realizes that Phiona has a special gift, especially when she starts winning against her own coach. 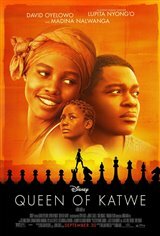 Based on a true story, and on the book The Queen of Katwe: A Story of Life, Chess, and One Extraordinary Girl’s Dream of Becoming a Grandmaster by Tim Crothers.